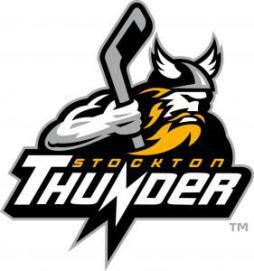 (September 25, 2013) The Stockton Thunder will have a pair of new voices on their broadcasts this season and both are STAA clients. Caleb Lamb takes over as the team’s play-by-play voice and Director of Broadcasting and Media Relations. Brandon Kisker will serve as color analyst and media relations assistant. The duo replaces Mike Benton, who moved onto the Alaska Aces last month. Both the Thunder and the Aces skate in the ECHL. Lamb is a 2013 graduate of Syracuse University. He was ranked as the third best collegiate sports broadcaster in the country in STAA’s 2013 Jim Nantz Award and All-America program. Kisker is a 2012 graduate of the University of Cincinnati and was as the voice of Bearcats ice hockey for three seasons. He spent the 2011-2012 season as a broadcast and community hockey intern with the Tampa Bay Lightning. “This is a great experience to continue learning and growing not only as a broadcaster, digital media, web, and media relations employee, but also as a teammate and person,” says Kisker. “I’m approaching this opportunity just as I did when I started with the Tampa Bay Lightning. I want to be a sponge and soak up all that I can in anything I can, so that I can contribute positively to the Thunder organization. Kisker has been an STAA client since spring of 2012. Lamb joined earlier this year. (Visit Caleb and Brandon’s STAA Talent Pages.